Sharing a title with one of Paul’s paintings, Egypt Station is the first full album of all-new McCartney music since 2013’s international chart-topping New. The album follows two of its tracks, I Don’t Know and Come On To Me, being released as double A-sides as a celebration of his 76th birthday last month. True to the inspiration behind its title, Egypt Station has a travelogue, concept album vibe. Between the opening and closing instrumentals, Station I and Station II, each song finds Paul capturing a place or moment before taking the listener to the next destination. Confirmation of Egypt Station’s release puts an end to speculation that began with the whiting out of Paul’s Instagram account as he turned up at various landmarks in Liverpool. The excitement reached its peak when he appeared on James Corden’s Carpool Karaoke, the segment included his surprise gig at Liverpool’s Philharmonic Pub where new track Come On To Me was debuted. 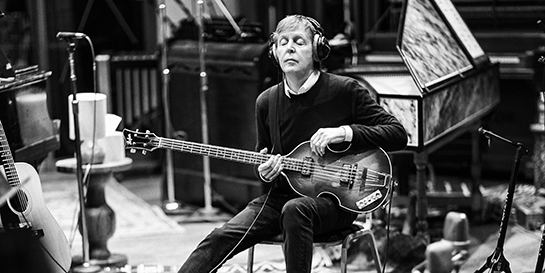 Virgin EMI MD Clive Cawley says, “Having worked with the great man across his previous four studio albums we’re no strangers to his greatness but this time around Macca has delivered what he loosely refers to as a “concept album” using the format of the classic LP to dictate the length and depth of the overall album. From what my untrained ears have heard, it’s feasibly his most excellent and concise slab of audio delight in many, many years. To be involved again with arguably the greatest songwriter of this or any generation makes us feel warm and fuzzy all over”. Egypt Station’s finishing touches were completed at Abbey Road Studios, with Paul returning last Tuesday to re-create the original Abbey Road album cover before performing a secret gig for friends and family. As well as having the Beatles icon back in the building, Abbey Road have been honouring the 50th anniversary of the band’s landmark film, Yellow Submarine, and have created a range of new merchandise. Last week Paul was also at LIPA in Liverpool for a Facebook live Q&A with Jarvis Cocker where he announced a secret show at the city’s Cavern Club for the following day. As the birthplace of Beatlemania and where the band played almost 300 times in the early 1960s, it was no surprise to see fans queuing for hours on Thursday to see the icon return to the club. McCartney is set to play three dates in Liverpool, Glasgow and London this December in support of the album release.